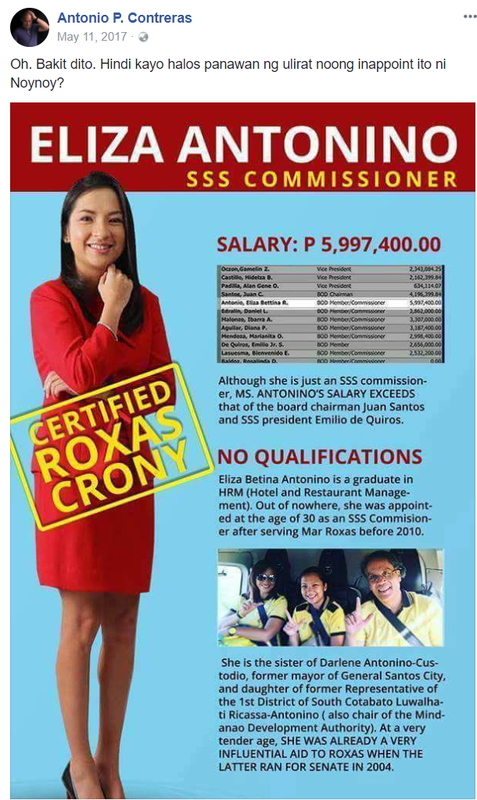 Antonio Contreras, a political analyst and professor of Political Science in De la Salle University brought the case of a Mar Roxas "crony" who was appointed as Social Security System Comissioner and was paid almost six million a year, despite an absence of qualifications. The woman behind the allegation is Eliza Antonino, who served as staff of Liberal Party standbearer Mar Roxas from 2004-2010. 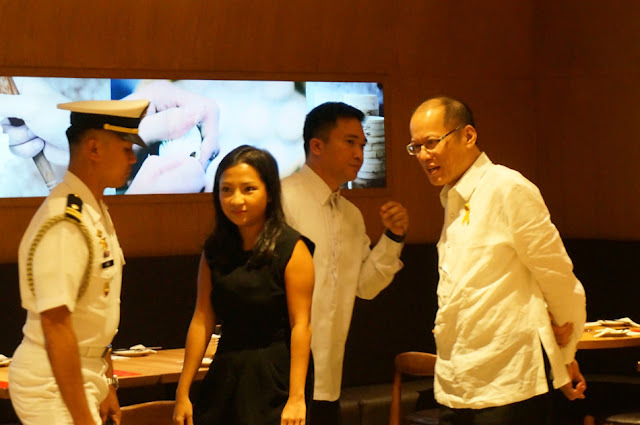 Antonino was appointed SSS Commissioner by former President Benigno Aquino III despite the fact that she has no other qualification, besides graduating from Hotel and Restaurant management in 2000. In 2016 a table spread in social media which showed that Antonino received 5.9 million in 2014. Roxas has denied the allegation, yet official Commission on Audit records show that the SSS Commisioner earned P1.3 million in 2011; P1.244 million in 2012; P2.373 million in 2013; and P5.997 million in 2014. The SSS commissioner's pay was greater than that of the board chairman Juan Santos and SSS president Emilio de Quiros. The appointment of Antonino was deemed to have occurred "out of nowhere". The commissioner is the sister of Darlene Antonino-Custodio who served as mayor of General Santos City. She is also the daughter of South Cotabato former representative Luwalhati Ricassa-Antonino. Reportedly, Antonino was "already a very influential aid to Roxas when the latter ran for senate in 2004".